My profession is a painting conservator, which is why I wanted to concentrate in the overall management and care of collections during my Mobius fellowship period. All information about treatments and ways to handle large collections was useful and topical for me. The new storage building, known as the Collections Centre, was finished in Tampere Art Museum few years ago. As a result, almost 15000 works of art were moved under the same roof with the conservation department for the first time. My intention is to make some kind of a long-term priority plan for conservation, which would make it possible to take care of art collections in a systematic way. During my Mobius fellowship period the National Gallery of Ireland had a special situation because of the renovations of the historical gallery and the Master Development Plan (MDP) to make a better home for the collection. I found it very interesting to study the working methods at the National Gallery, and to get useful knowledge on handling the collections, which were almost the same size as the collections of Tampere Art Museum. The National Gallery of Ireland (NGI) is the biggest art museum in Ireland. It is a state museum with about 118 employees. The funding of the gallery comes both from government and private benefactors. Private sponsors hold a big role also in the funding of conservation. The gallery is free of charge for everybody, and it is one of the main attractions in Dublin with 640 000 visitors last year. During my Mobius fellowship the situation at The National Gallery of Ireland was exceptional. Half of the museum was closed due to renovations, which took place before the museums 150th Year Anniversary. The National Gallery of Ireland was first opened for the public in 1864. The Master Development Plan (MDP) for a better MGI started in 2011 and the whole Gallery will be re-opened in 2016. The aim of the renovations is to improve the management and the care of collections by upgrading the historical building to meet the modern international environmental and safety standards. The new Millennium Wing of NGI, opened in 2002, was in use for temporary exhibitions. The Beit Wing, which was built in 1968, was partly open for permanent exhibitions with highlights from the collections of the museum. Many offices, archives and all of the storages were moved and situated temporarily to these two wings, and so was the conservation department. All the collections were thus under the same roof, mainly because of all day round safety and security reasons. The collection of NGI is almost as big as the collections of Tampere Art museum. NGI collections consist of over 15 000 works of art and include about 2600 paintings, more than 11000 works on paper and around 3000 sculptures. Benefactors and donors have had a key role in the development of the NGI collection in past and present. 45% of acquisitions to the collections come from private individuals. The same trend is growing in Finland. At the National Gallery of Ireland the works of art date between the early thirteenth century and the mid-twentieth century. Our own collections in Tampere are mainly from the 19th century onwards. Differences can also be seen in the materials of paintings, particularly in panel paintings, which are very rare in the collection of Tampere Art Museum. The conservation at NGI has a fundamental role in making the physical care of collection to follow the international standards. 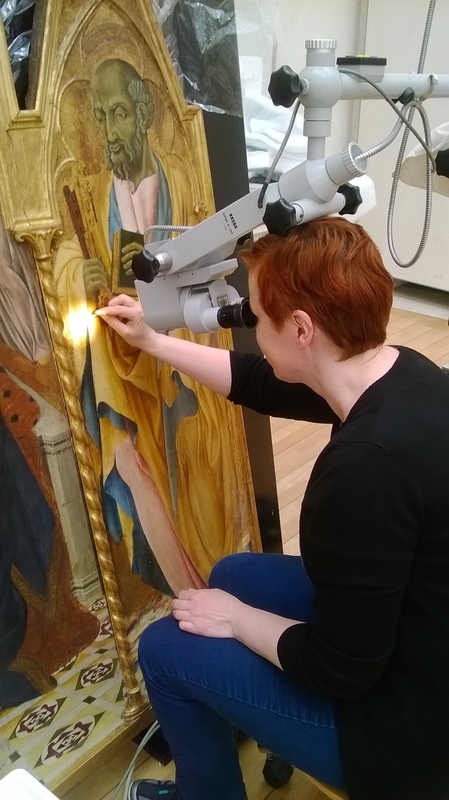 Conservators work in close relations with photographers and curators when researching materials, structures and techniques of artworks and also when analyzing earlier conservation treatments. With conservation the artworks are maintained as close to their original appearance as possible. This happens by following the guidelines of the reversibility and minimum intervention. First conservation studio employing three conservators was opened in 1966. For a long time, the studio was just a small room on the upper floor with plenty of skylight. Because of the renovations it was moved a couple years ago to a bigger, temporary space. The open space with skylight windows is shared with painting and paper conservation and it was still a little bit crowded. Therefore it was practical to work with only one painting at a time. In the summer 2016 NGI will be reopened for public, which means that over 400 paintings are going to be exhibited and every painting should be treated before that. This keeps the conservators busy. 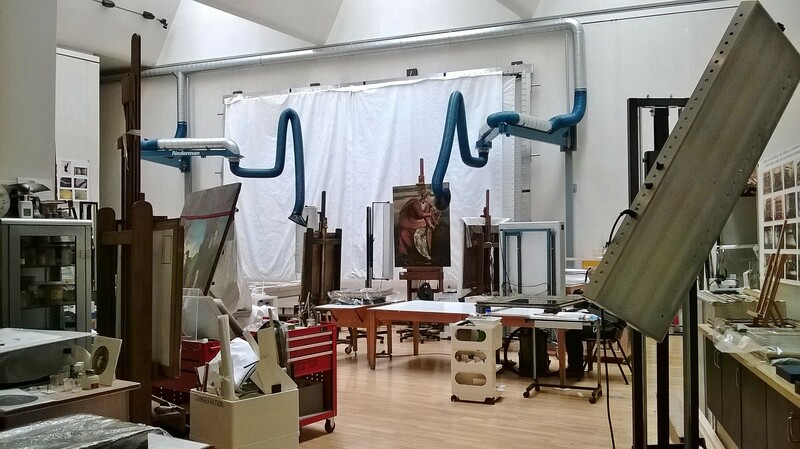 In May 2015 the total amount of the conservators was 16, consisting of 7 painting conservators, 3 paper conservators, 2 photographers and 4 interns. I was working as a volunteer as the eighth painting conservator. The department was multinational and many of the conservators were freelancers or hired temporarily for the rehanging project until summer 2016. The funding for conservation was coming mostly from private foundations and sponsors. The whole collection of NGI had gone through an individual condition check, report for each artwork before the renovation (MDP) and transport to temporary storages. The conservations process of the 2600 paintings took two years for two conservators. These reports have been a very good base for planning the conservation and making new rehanging plans. This kind of ground survey would be good to arrange for the collections in the Tampere Art Museum too. The NGI conservators use the Museum System database for documentation. The system is similar to the Muusa system in Tampere. It was bought from The Getty Research Institute and it includes the basic facts for documentation and conservation treatments. This database also includes some other parallel systems for loans etc. Every work of art is categorized according to their condition and they are also labeled with a 3-level color sign to integrate the priority of treatments. In Dublin I worked as part of the team doing the necessary conservation treatments for the upcoming rehanged exhibition. Working methods were quite similar to Finnish ones and I started working with paintings on canvas. Surprisingly the first painting was actually an oil painting on paper (earlier lined on canvas), and finally I successfully made some strengthening for the fragile edges of painting. At the NGI almost every painting on canvas was earlier lined, relined or even double lined. In the past the tacking margins of paintings, frames and stretchers were usually covered with brown paper tape from the reverse side of the paintings. Now all old paper tapes and paper residues (without markings) were removed because of better monitoring for insects. This was one of the good tips I got because nobody wants to have any insects in the storages. I also got a possibility to explore the paper conservation, photography studio and art handling space that were situated close to the painting conservation studio. Photographers used a high-quality multi-shot camera (Hasselblad), which makes it possible to achieve right colors and produce distortion free pictures. The sizes of the photo prints were A2 to get better details. Good infrared, ultraviolet and X-ray photos are necessary tools especially for the removal of overpaintings. Paper conservators worked partly in the same space with the painting conservators. They followed the Japanese methods, among other things, making wheat starch with wooden (mahogany) equipment. It was also notable that they only used cotton cardboard with rounded outer corners for passepartouts because in that way the board does not divide into lobes and the corners are comfortable without sharpness. The NGI collection contains many masterpieces of paintings on panel made by European artists, while Tampere Art Museum has mainly Finnish art and local masters in its collections. We don´t have any particular panel paintings, and for me they represented a totally new experience. I got a chance to try to clean one panel painting and follow the conservation of Perugino´s Pieta (The Lamentation over the Dead Christ), a painting dated at end of the 15th century. The conservation of Perugino´s Pieta started in the summer 2014 and it took almost a year to complete. This painting was damaged a long time ago and it was earlier badly restored. The conservator slowly cleaned off the old varnish, the overpaintings and unsuccessful restorations. Now the painting is ready for rehanging, with clear original colors. By interviewing the conservator I got to know many of the old traditional methods and techniques for the panels and grounds and facts about old permanently changed mineral pigments and cartoons for sketching the motifs etc. I also got a possibility to try working on an Italian panel painting by Giacomo del Pisano from the 15th century. Pisano´s painting The Virgin and the Child with SS Mary Magdalena was made on panel and it needed to be cleaned. My task was to take off some old, yellowed varnish and overpaintings from a very small area, approximately 15 cm x 8 cm. The cleaning of this tiny area and making the new retouching took me about two weeks because I had to work under a microscope to understand the structure of the painting. I noticed that removing the varnish and especially removing the old overpaintings was difficult, exact, troublesome and time-consuming, and I have to say that I will rather be a conservator of paintings on canvas. I assisted in the conservation and the documentation of two big Florentine panel paintings (actually panels for wedding chests) from the late of 15th century to get them ready to be sent to Japan. The whole project took two weeks. The panels were old with inactive wormholes of termites, but we did some impregnation to make the panels more stable. The installation of glazing and making all the fittings for curved panels was hard and slow, but conservators at NGI are used on making frame installations, inner framings and restorations of frames. After conservation and frame installation I followed the packing of the panels. Nowadays it is a trend to tell about conservation and what is happening behind the scenes in the museums. At the NGI conservation where most of the money is coming from outside, it is very important to show people the importance of the conservation and the care of the collections. They do this with the help of posters, blogs, websites and tours on the conservation facilities and also by giving lectures about conservation, their resent achievements and research etc. The websites of the NGI conservation, especially the Featured Projects are highly inclusive, with detailed step by step information about conservation. At NGI there were several ongoing conservation projects, usually supported by outside sponsors. Through these special projects conservation was given higher visibility. The funding of the projects was based on grants in many cases and the head of the conservation was in leading role to find the funding. The projects were also linked to collaboration with other institutions in terms of analyzing materials. One of the conservation projects was the Battle of Boyne conservation project in Malahide Castle. The Battle of Boyne by Jan Wyck, made in 1693, has been exhibited in Malahide Castle since 1976. The conservation project will last about one year and will carry out full-scale treatments like cleaning off the discoloured varnish. The conservation is done in the Castle and the visitors have a possibility to see the conservators at work and ask them questions about the conservation on site. In this project two conservators work together and they also write a blog on the project. The conservation of The Marriage of Strongbow and Aoife by Daniel Maclise, 1854, is one of the projects with outside funding. This painting is a national treasure and one of Ireland´s best known historical paintings that has also been studied by many scholars. Conservation of the painting began in 2010 and it is still going on because of the unusual size of the painting (315 x 513 cm). Conservation will be finished for the rehanged exhibition in 2016. The conservation project also includes an online resource with material about conservation and treatments, a timeline, an analysis and a technical survey with series of short films on the websites of the National Gallery of Ireland. In many places inside the gallery, especially in the entrance hall, there were many stories in the form of posters about interesting conservation projects. Usually the posters were reveling something astonishing like a hidden head or a crucifix. On the Heritage week conservators give lectures to the public and from time to time they write to websites about conservation and research projects. Altogether the websites of the NGI conservation are very informative and extensive giving a lot of information about the past and ongoing projects. This was my first time working abroad, and I was very excited for this opportunity especially on a practical level. During my Mobius fellowship I tried to find some differences in conservation practices between Finland and Ireland, but I have to say, that there weren’t too many. Conservation commonly follows the international standards and ethical principles. Only some small practical matters were different, which was actually comforting to realize. The fellowship period was also a way for me to see my own work in Finland from a distance and to notice that problems in conservation are universal and this ties all colleagues together. Altogether I got many ideas and learned basic facts about the long-term priority plans for conservation, because at NGI they really have put plans into practice.